Some singers have a Wagner album. 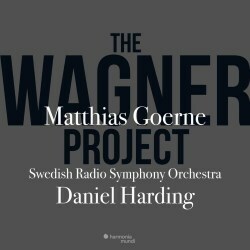 Matthias Goerne has a Wagner project. It’s slightly problematic, but on the whole it’s very good, and it showcases a lot of what this artist is excellent at. To get the grumbles out of the way first, I found the whole “project” idea slightly overblown, mainly because there is nothing explanatory about it in the booklet notes at all, save some general musings on why Wagner was an important composer. What we have, therefore, is effectively “just” a double disc of bleeding chunks, and boy do they bleed! With the honourable exception of the two orchestral excerpts from Parsifal (and those that are concert pieces anyway, such as Isolde’s Liebestod), each of the numbers is left hanging, often cruelly so, leaving a strange sense of dissatisfaction. It’s ridiculous, for example, to end the Meistersinger Act 3 prelude with the first sign of David entering the shop, or Rheingold with a touch of Loge’s theme entering. Would it really have killed them to tailor off the tracks with some sort of cadence? Nor even can they have felt it was important to keep some ideological purity, because the Parsifal extracts are finished beautifully, and highly satisfactorily. Very odd. Goerne’s singing is very good indeed, though, and it’s fascinating to hear how he takes his extraordinary gift for Lieder singing and transfers it to the grandest of grand stages. For those who have been following his Wotan in the Hong Kong Ring, this may come as less of a revelation, but I found him extremely compelling. The things that make his song recitals so gripping are the majestic scale of his singing and his impeccable identification with the text and its meaning, and it’s wonderful that he brings all of these to his Wagner interpretations. There is scale, depth and height to all the bass-baritone parts he has chosen here; the finest, for me, being the Flying Dutchman. This is the role I would most like to hear Goerne sing in the theatre. He brings psychological penetration to the depths of this tortured soul, suggesting a universe of pain in the depths of his being. You can hear the rage in “Wie oft in Meeres”, followed by forlorn hope in “Dich frage ich”, and then towering defiance as he contemplates the Day of Judgement, facing up to God in his majesty and pretty much staring him down. It’s thrilling, and probably the vocal highlight of the disc for me. His other interpretations are also fine, though there’s a predominantly melancholy tone that becomes slightly uniform after a time. His Walküre Wotan, for example, is magisterial; full of yearning, frustration and vast reserves of sorrow; but he is somewhat indistinguishable from the young god of Rheingold, who doesn’t sound particularly fresh or full of hopeful plans. His Wolfram is fantastic, though, giving even Christian Gerhaher a run for his money in the Abendstern solo, and his Amfortas is full of the universe’s sorrow, though his choice of this Act 3 monologue is rather unfortunate, as it cuts off just when you think it’s about to get going. I never see King Marke’s lament as anything other than unbearably tedious, for all that it is beautifully sung here. Sachs’ Fliedermonolog sounds deep and full of wisdom, though I couldn’t help wonder whether the Wahnmonolog would have suited the general tenor of the disc better. The real star of any Wagner opera is the orchestra, however, and the Swedish RSO are really fantastic here. I’m open to correction, but I can’t think of any other Wagner they’ve recorded previously. If this really is their first time then we have all been missing out, and I hope the success of this disc encourages them to record more. They sound as though they’re completely inside the music, and not just in the stand-alone orchestral items. They surge and thrill during Wotan’s farewell – for all that I thought Harding’s tempo too slow – and they create a gorgeous bed of sound for Wolfram’s serenade, as well as for the desolation of King Marke. The preludes are even finer, however. The strings surge with emotion during the Meistersinger third act prelude, and you really feel the fleck of the sea air in the Dutchman overture. The Parsifal prelude unfolds with an unhurried glow, and the Good Friday Music blossoms organically like a flower opening to the sun. Daniel Harding’s tempi can be a little quixotic, but on the whole I was convinced by his grasp of the structure, and the Harmonia Mundi engineers capture everything with textbook clarity, albeit with rather a lot of echo around the voice in places. Not perfect, then, but pretty damn good, and all of the artists involved create a sound world that is sumptuous, sensuous and wonderful; it might even qualify as a Wagnerian guilty pleasure.